There’s always an occasion to send a gourmet gift from Chocolate Covered Company. Choose from their wide selection of irresistible treats, including Belgian chocolate-covered strawberries, elegant cookie towers, festive cake pops, mini donuts, and more. 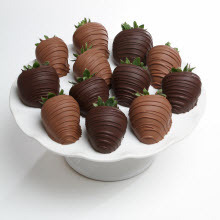 Connoisseur Club members save 20% on decadent chocolate treats from Chocolate Covered Company!